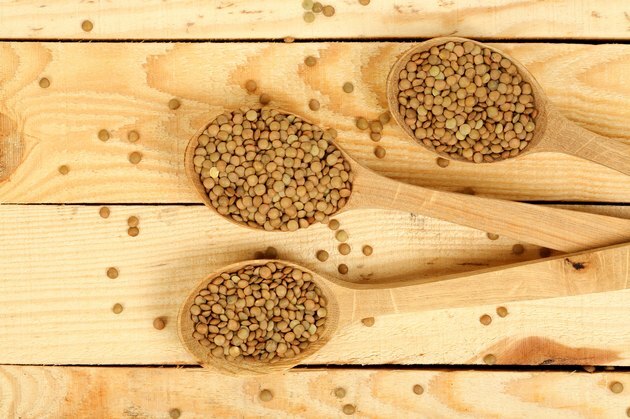 Lentils belong to the legumes class of vegetables that also includes peas and beans. Lentils, like their cousins, are low in fat, contain no cholesterol and offer high amounts of potassium, magnesium and folate, according to the Mayo Clinic. Legumes are often left out of typical American diets, even though they are a high source of protein and can substitute for proteins obtained through eating meats. A 7-oz. serving of lentils contains about 230 calories and 1 g of fat, while a 7-oz. serving of hamburger contains about 548 calories and nearly 45 g of fat. Use a pressure cooker to cook lentils in about one-third less time than it might take to cook them traditionally. Pour 6 cups of water into a large pressure cooker. Bring the water to a boil over high heat. Lock the lid onto the cooker as it boils; take care to avoid the steam. Turn the heat down slightly once steam begins to escape from the pressure cooker's regulator and cook the lentils for one minute under high-pressure. You begin your cook time as soon as steam begins to escape the cooker. Turn off the heat from beneath the cooker. Allow the cooker to sit undisturbed for eight minutes, letting the pressure drop naturally. The lentils will continue to cook as the pressure drops from the cooker. Tilt the pressure cooker away from you to avoid the escaping steam from the lentils as you unlock the lid. Check the lentils for tenderness and continue to simmer with the lid off the cooker over medium-low heat until tender.